Sons Of The American Legion Squadron 1830.
click image to go to SAL National website. 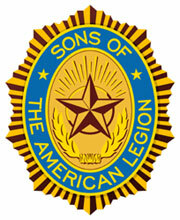 Any male wishing to join The Sons of the American Legion at Chili Squadron 1830 must be able to prove that his father or grandfather was a veteran in service to America during the American Legion eligibility dates listed on the membership page. (And therefore the parent must be eligible to Join the American Legion). If living, the parent must be a member in good standing in the American Legion. If desceased, you must be able to provide a copy of their discharge papers (DD-214) proving their eligibility to join the American Legion. Any person wishing to join Squadron 1830 is encouraged to attend one of the sons meetings and fill out the apropriate forms and bring theirs parents discharge papers with them. (And when the webmaster learns how to load a membership form on this site then you can print it out and sent or bring it in). Meetings will be held on: (usually held on the second Tuesday of each month @ Chili American Legion Post 1830). To visit the Dept. of N.Y. S.A.L. Website, Please click here! For a list of squadron officers, please see the Post Officers page on this website!